To Dog With Love: Watch us "Play" on Homes.com Today! Watch us "Play" on Homes.com Today! Our backyard is featured as a place to "play" on Homes.com today! It's all part of the Homes.com Inspiring Home Moments campaign. Some of you may remember that I bought my backyard (and house) so that Cosmo would have a place to play. Before that, we lived in a condo and it was tough raising an active dog without a yard. That's ultimately why we started doing agility, so that Cosmo would have an outlet and a place to play. But now, it's been a lot easier raising a young pup like Rocco with our own place to play unleashed. And, we have a place where we can practice agility skills everyday. Short little practice sessions work great, especially with a young pup. So what's the biggest thing you've ever bought for YOUR pet? Let me know in the comments below. And then check out our home story on Homes.com! Love your story and photos. Seem like you found the perfect home. Have a wonderful Wednesday! Thanks Venus! We definitely found the perfect backyard! Wow Miss Diane and Rocco! You two are famous. Can I say "I knew you when?" BOL I am running over to read your story now. It's still "when" and always will be so we can be pals forever! hahaha! Thanks for stopping by! Thanks Janet! I think all Havanese are happy little ones! Thank you! It was a fun post! Lucky dogs. Your yard is lovely. Mr. N has to make do with a stuffed animal bigger than him. hehe! It is REALLY nice having a yard. I think the RV counts! Lovely yard. Have a tremendous Thursday. Thanks! Happy Thursday to you! Ha! We have loads of dog beds too! We just got the parts for some DIY weave poles too. I wanted 2-by-2s so we had the bases made and now I just need to clean, paint, add the poles and tape! That's nice you donated your agility equipment... we don't have room for contact equipment or we'd get that too! How neat is that! Mom being a realtor knows all about homes.com. We always like a home with a fenced yard and lots of sidewalks and trails for walking. That's all good stuff for a dog-friendly neighborhood! 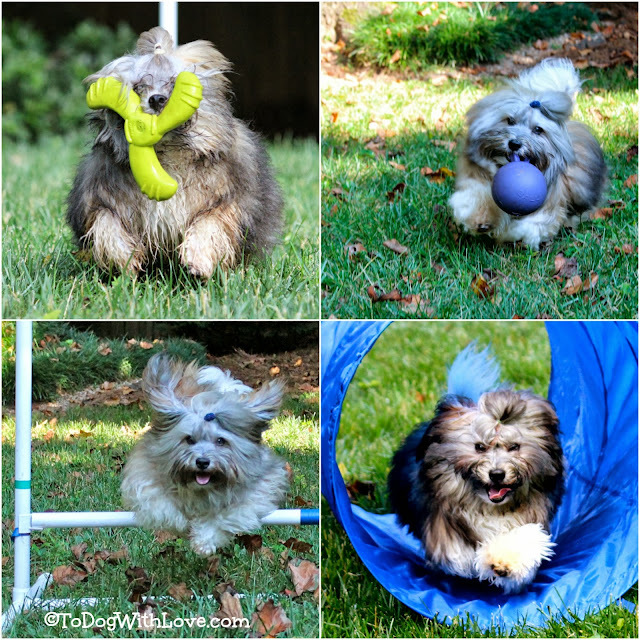 A fenced yard was a big selling point for me as well as a walkable neighborhood... and a yard that didn't have a lot of prickly stuff that would get caught in Havanese fur! Nice! When I got married a few years ago and we started looking for a house, a home with a fenced yard was my priority for my dogs. Previously, me and my two big dogs lived in a one bedroom apartment. Every house I've purchased has been within 4 miles of the office....so I can go home for my pups at lunch.